We began farming the land in 1901, but it wasn’t until 1957 that we took a giant leap into turkey rearing, and it all started with a rather pointed gift. Tom Copas Senior was a teenager in 1957, young, sprightly and far too impatient for school; his father thought it was time for a hobby. The result, a gift of 153 turkeys, blossomed into a small business which in turn became the much respected heritage brand Copas Traditional Turkeys is today. 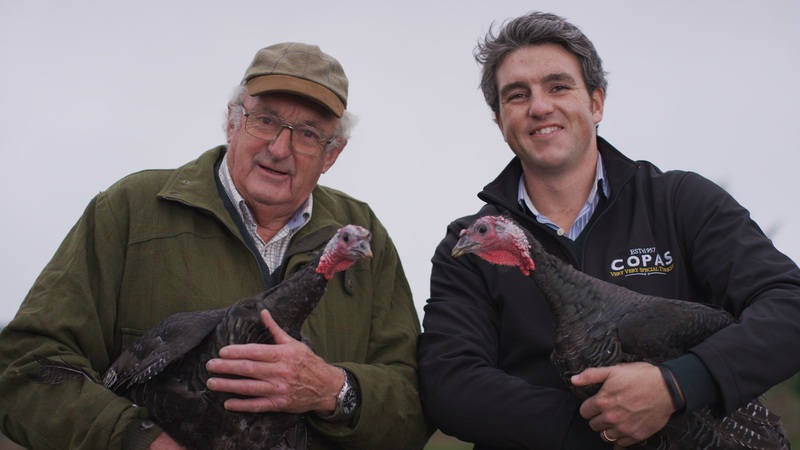 Now in its 60th year Copas Traditional Turkey’s is truly a family business with Tom and Brenda’s children at the helm, each led by the same values and artisan methods that Tom embraced when he met his first flock of feathered friends. We believe that the very best turkey will have been given a long life, room to roam across meadows and will have gone through age old production processes, including hand plucking and game hanging, to enhance and preserve the birds flavour, naturally. Copas Turkeys are loved by some of Britain’s best butchers, farm shops, delis and food halls as well as a loyal following of home delivery and farm gate customers. Christmas is truly a day of celebration, relaxation and gaiety which is why, over the last sixty years, we have dedicated each year to producing the finest award winning turkeys in the land, just for Christmas.